Barbara Muir Paints: Speaking of love -- here's something! as the winter wind howled outside, rattling the windows. going on with this series, the food will turn into characters and start to speak. was a work of art!!!" That's how a perfectly served breakfast strikes me. served, and I defy you to look out the window and concentrate on anything else. that it had to be writ large. 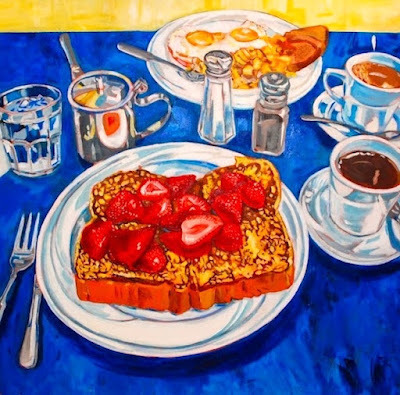 Lovely story about painting, Paris and love...and breakfast! Thank you. The picture is wonderful. Sweet story, Barbara! Beautiful painting! By the way, if you ever get the urge to see the typewriter eraser again, we have one of them here in Las Vegas. His original is in Washington, D.C., but the one here is cool. He has another one in Seattle. Happy Saturday! and Cologne, Germany to see his dropped ice cream too.